It's only hindsight that delivers the argument of the test of time, and Things Are Getting Better passes with flying colors. 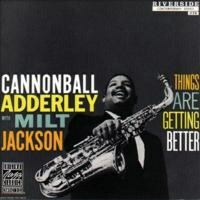 October 28, 2013 is the 55th anniversary of the making of Things Are Getting Better by Cannonball Adderley and Milt Jackson. It's not an anniversary that's celebrated, although historically speaking the year 1958 gave us 1959 by order of succession, which gave us the biggest year in jazz development and artistic immortality. Thanks to 1959's contributions a la Kind Of Blue, Mingus Ah Um, and Time Out, '58 won't ever be considered a turning point, if not the turning point where jazz would conquer the mainstream in the '60s. That's exactly what happened, though. Through the eyes and ears of Cannonball Adderley, the advent of soul-jazz will be integral just a few years later. Deep within the discography of Julian "Cannonball" Adderley are the some of the greatest examples of soul-jazz ever heard. Well-fitting for the man who basically invented the genre. At a time when everyone else was still reeling from the narcissism of bebop, barely slowing down enough to create "cool", Adderley was there. When the sounds of black gospel and modern blues began their reinterpretation through jazz, Adderley was there. When Miles Davis went modal and Ornette Coleman delved into human chaos, Adderley found his direction by incorporating the new soul formula into his own. In fact, you can find the real shape of jazz to come through Adderley more than almost all of his contemporaries. It's only hindsight that delivers the argument of the test of time, and Things Are Getting Better passes with flying colors. While this particular generation of jazz musicians were in the thick of it, all were searching for that happy medium between the artistic forefront and the road to riches (some are still too proud to admit that money was a factor in their material selection and composition, but just like everyone else, bills must get paid, right? ), which Adderley would find in '65 with Mercy, Mercy, Mercy. Things Are Getting Better isn't the first leap into soulful R&B interplay...even for Adderley. Simplification within jazz structure was part of a natural transition as popular tastes moved from show tunes to beat music. But as a pivotal moment between cool jazz and soul-jazz, between "Autumn Leaves" and "Why Am I Treated So Bad", Things Are Getting Better could be properly described as the missing link...a record that points in all directions including the aforementioned that will send the genre consistently to the top of the pop charts in the '60s. Sharing the spotlight with Milt Jackson, Adderley pairs well with the vibraphonist. Jackson's penchant for the unorthodox is accented greatly by Adderley's ability to keep the piece grounded. This subtle restraint in the midst of free-flight is greatly exemplified in the opener, "Blues Oriental". Choosing to introduce this album with the most experimental of the set is an easy setup for future disappointment, but after a good, thoughtful listen, what's not to like? This album weaves multiple styles of song through their collective filter, resulting in this incomparable spectrum of sound that makes fans out of skeptics and disciples out of students. Here's Adderley playing with the runs that defined "Freddie Freeloader" less than a year later. Here's Jackson playing to his roots with few detours. Here's a well-matched rhythm section consisting of Wynton Kelly, Percy Heath, and Art Blakey...all providing a momentous moment in jazz under-appreciated enough to keep Things Are Getting Better consistently the subject of rediscovery by each new generation. This generation gets a small bonus with the new reissue. Alternate takes of the ballad "Serves Me Right" and "Sidewalks of New York" along with the inclusion of "A Few Words" (studio chatter) don't do much more than prove that these guys could play well together. What these tracks also do is show a group-wide respect for each other's talents, even if more takes are needed. In essence, Things Are Getting Better aims to please everyone while providing those personal flourishes that makes good jazz great.